14:13 And I heard a voice from heaven saying, “Write this: Blessed are the dead who die in the Lord henceforth.” “Blessed indeed,” says the Spirit, “that they may rest from their labors, for their deeds follow them!” 14 Then I looked, and lo, a white cloud, and seated on the cloud one like a son of man, with a golden crown on his head, and a sharp sickle in his hand. 15 And another angel came out of the temple, calling with a loud voice to him who sat upon the cloud, “Put in your sickle, and reap, for the hour to reap has come, for the harvest of the earth is fully ripe.” 16 So he who sat upon the cloud swung his sickle on the earth, and the earth was reaped. The “henceforth” means that the blessedness will occur after death for those who die in the Lord. The situation is very different for those who die outside the Lord. In this life and on this earth, Rome seemed blessed and the Lord’s people seemed cursed — but what a difference after death! Remember, things are not what they seem! We have seen many images of Christ in this book, but this must be one of the most striking: Jesus wearing a golden crown and carrying a sharp sickle. Those today who believe that Jesus will save everyone (expect perhaps Hitler) need to consider this image of Christ very carefully. A common symbol for judgment is the separation of wheat and chaff, and separation is a recurring theme in this book. The call to the church was the same then that it is now: “Come out from among them, and be ye separate, saith the Lord, and touch not the unclean thing; and I will receive you.” (2 Corinthians 6:17) We need to separate ourselves now, so that we will also stand separate on that last great day when Jesus separates the sheep from the goats. If we are no different than the goats today, then we will likely end up numbered among the goats on that day as well. The winepress of God’s wrath will eventually be experienced by all who leave God out of their lives and their thoughts. 17 And another angel came out of the temple in heaven, and he too had a sharp sickle. 18 Then another angel came out from the altar, the angel who has power over fire, and he called with a loud voice to him who had the sharp sickle, “Put in your sickle, and gather the clusters of the vine of the earth, for its grapes are ripe.” 19 So the angel swung his sickle on the earth and gathered the vintage of the earth, and threw it into the great wine press of the wrath of God; 20 and the wine press was trodden outside the city, and blood flowed from the wine press, as high as a horse’s bridle, for one thousand six hundred stadia. We see two angels — one angel who carries a sickle and another angel who comes “out from the altar” and who “has power over fire.” The first angel begins to “reap the earth” when the second angel gives him the go-ahead. The gathering of the vintage is a classic figure for God’s judgment of the wicked. He tramples the wicked as one tramples grapes. Verse 20 tells us that the grapes are trodden “outside the city.” Which city? Rome is the most likely candidate, but some commentators argue that this city is the city of God, the church. Isaiah 63:3-6 is a judgment against Edom in which God is pictured as trodding the wine press alone. I have trodden the winepress alone; and of the people there was none with me: for I will tread them in mine anger, and trample them in my fury; and their blood shall be sprinkled upon my garments, and I will stain all my raiment. For the day of vengeance is in mine heart, and the year of my redeemed is come. And I looked, and there was none to help; and I wondered that there was none to uphold: therefore mine own arm brought salvation unto me; and my fury, it upheld me. And I will tread down the people in mine anger, and make them drunk in my fury, and I will bring down their strength to the earth. A few verses earlier in Isaiah 62:12 we see a reference to “the holy people, the redeemed of the LORD,” and we see that they will be called “Sought out, A city not forsaken.” What we see there seems to be a picture of God trodding the wine press outside of the city alone. Perhaps, here, too, we see God stepping alone outside of his own city to trod the wicked in his wrath. The vast amount of blood in verse 20 graphically depicts the severity of the judgment. The blood flows in a river as high as a horse’s bridle and 1600 stadia or furlongs long, which is about 200 miles long. Its intent is to frighten, and it does a very good job! This coming judgment will be terrifying. As Egypt lost horse and rider in the Red Sea, so will Rome be engulfed, but this latter sea of blood will be much redder than the Red Sea! Verse 20 causes a fair bit of trouble for the literalists. A river of blood 200 miles long, a modest 100 feet wide, and 5 feet deep would contain about 4 billion gallons of blood, which is enough blood to fill up over 3 billion people. Literal? Of course not. Terrifying? Definitely. Why 1600 stadia? Is there some symbolic significance in that number? It is probably not a coincidence that 1600 is the square of a very familiar Biblical number, 40. The number 40 is often used to denote a period of trial or tribulation, with the exodus being the prime example (Psalm 95:10). Thus, 1600 may simply indicate tremendous tribulation, and the squaring may point back to our previous discussion of the significance of the number 2 in Chapter 13. Or 1600 may be the earthly number 4 squared multiplied by 10 squared for completeness, thus depicting a judgment against all who dwell on the earth (which is how the wicked are described in this book). It is also possible that the number was chosen simply to depict a great deal of blood. To paraphrase Freud, perhaps in this oil painting from God a brush stroke is sometimes just a brush stroke. Where are we at the end of Chapter 14? 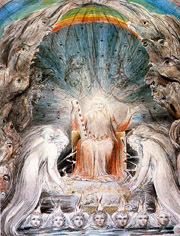 Before the seals were opened we had a vision of Heaven assuring us that the true throne was in Heaven and not in Rome. Before the trumpets were sounded we were shown a period of silence in Heaven and told that the coming judgment was occurring due to a call for justice by the saints. Chapter 15 will show us a third vision of Heaven and occurs before the bowls of God’s wrath are poured out in Chapter 16. This book has a beautiful structure! So far, the judgments have been partial and have allowed for repentance. The judgments of the seven bowls are total and final, and repentance will soon no longer be an option (although even here we will see glimpses of the longsuffering nature of God extending an opportunity for repentance). Verse 1 tells us that, with these final plagues, the wrath of God is ended. What does that mean? It means that this is God’s final word with respect to Rome, the great enemy of God’s people on which this entire book has been focused. But it says the wrath of God is ended. Doesn’t that mean we have finally reached the end of the world with this verse? No, it doesn’t. First, remember the time frame of the book — it contains things that were to shortly come to pass. We are told that twice at the beginning of the book and twice at the end. Also, thou son of man, thus saith the Lord GOD unto the land of Israel; An end, the end is come upon the four corners of the land. Now is the end come upon thee, and I will send mine anger upon thee, and will judge thee according to thy ways, and will recompense upon thee all thine abomina­tions. The judgment of Jerusalem described in Matthew 24:13-14 is another example: “But he that shall endure unto the end, the same shall be saved. And this gospel of the kingdom shall be preached in all the world for a witness unto all nations; and then shall the end come.” Was that end the end of the world? No, because just a few verses later in Matthew 24:34, Jesus said, “This generation shall not pass, till all these things be fulfilled.” So the “end” in verse 14 was a first century event — the judgment of Jerusalem in A.D. 70. As with Israel in Ezekiel 7 and Jerusalem in Matthew 24, there is a similar end with Rome in Revelation 15. In short, God can use the word “end” in contexts apart from the end of the world, and that is how the word is used here. The Greek word teleo translated “end” here simply means to carry out, accomplish, perform, or fulfill, and that is exactly what is happening in this chapter with regard to Rome. Swete says that these martyrs have come safely through the sea of martyrdom to arrive at the shore of heaven. Some translation of verse 2 indicate that those who conquered the beast were standing “on” rather “beside” the sea of glass. If so, then perhaps that small change indicates that the saints have moved closer to the throne through their suffering. Philippians 3:10 reminds us that we become like Christ by sharing in his suffering. • Zechariah 13:9 And I will bring the third part through the fire, and will refine them as silver is refined, and will try them as gold is tried: they shall call on my name, and I will hear them: I will say, It is my people: and they shall say, The LORD is my God. • Malachi 3:2-3 But who may abide the day of his coming? and who shall stand when he appeareth? for he is like a refiner’s fire, and like fullers’ soap: And he shall sit as a refiner and purifier of silver: and he shall purify the sons of Levi, and purge them as gold and silver, that they may offer unto the LORD an offering in righteousness. • 1 Corinthians 3:12-15 Now if any man build upon this foundation gold, silver, precious stones, wood, hay, stubble; Every man’s work shall be made manifest: for the day shall declare it, because it shall be revealed by fire; and the fire shall try every man’s work of what sort it is. If any man’s work abide which he hath built thereupon, he shall receive a reward. If any man’s work shall be burned, he shall suffer loss: but he himself shall be saved; yet so as by fire. Verse 2 also says that they held harps of God in their hands. What are the harps of God? We looked at this issue in our discussion of 5:8. Remember that what we are seeing here are symbols. This language is figurative. In the same verse where we see harps, we also see a sea of glass mingled with fire and beast along with its image and the number of its name. These harps are symbols for praise, just as elsewhere incense is used as a symbol for prayer. We saw a similar symbol in 14:2 ― “the voice I heard was like the sound of harpers playing on their harps.” And that verse is very instructive — perhaps the harps of God symbolize the harps that he created when he created the human voices that sing his praises. And for those who think they can worship God by using their human hands to play a harp that was made with human hands, perhaps they should consider Acts 17:25 ― “Neither is [God] worshipped with men’s hands, as though he needed any thing, seeing he giveth to all life, and breath, and all things.” We should worship God with the harps that he made — our voices. In verse 3, they sing the song of Moses and the song of the Lamb. The song of Moses in Exodus 15 celebrated a great victory of God over Egypt, the great enemy of God’s people. Here the song celebrates another great victory over another great enemy, Rome. The song of the Lamb celebrates the same victory because it is only through the Lamb that such a victory was possible. That both songs are sung confirms our view that the woman in Chapter 12 represents the faithful remnant under both covenants who are united in Christ as one redeemed people. We have seen many comparisons in this book with the events of the Exodus, and here we see yet another with the song of Moses. But there is a key difference between the two events: The deliverance from Egypt was a physical deliverance while the deliverance from Rome was a spiritual deliverance. Hebrews 3 likewise tells us that Jesus “was counted worthy of more glory than Moses, inasmuch as he who hath builded the house hath more honour than the house.” Moses could do nothing for a dead Israelite, yet in Revelation we read that in the Lamb the dead are blessed. In the presence of God the martyrs forget themselves; their thoughts are absorbed by new wonders that surround them; the glory of God and the mighty scheme of things in which their own sufferings form an infinitesimal part are opening before them; they begin to see the great issue of the world-drama, and we hear the doxology with which they greet their first unclouded vision of God and his works. Is Revelation all about heaven and the end of the world? No. But does this book tell us a great deal about what Heaven will be like? Absolutely. Some day we too will be lost in the joy of being before God. In verse 3, some translations have “king of the ages” while others have “king of the nations.” The ancient manuscripts are divided between the two, but “king of the nations” seems to fit the context better. In any event, Jesus is King of kings, which means he is the King of the ages and the King of the nations. • Jeremiah 10:7 Who would not fear thee, O King of nations? for to thee doth it appertain: forasmuch as among all the wise men of the nations, and in all their kingdoms, there is none like unto thee. • Psalm 86:9 All nations whom thou hast made shall come and worship before thee, O Lord; and shall glorify thy name. 5 After this I looked, and the temple of the tent of witness in heaven was opened, 6 and out of the temple came the seven angels with the seven plagues, robed in pure bright linen, and their breasts girded with golden girdles. 7 And one of the four living creatures gave the seven angels seven golden bowls full of the wrath of God who lives for ever and ever; 8 and the temple was filled with smoke from the glory of God and from his power, and no one could enter the temple until the seven plagues of the seven angels were ended. What is the tent in verse 5? It is the tent of witness (or the tent of testimony) that held the ark of the covenant in the inner sanctuary of the temple. Only the High Priest could enter this inner sanctuary where God dwelt and then only once a year with the blood of an innocent victim. The priest would carry a censer of incense that billowed smoke to ensure that he did not see God. And John sees this tent opened. What comes out of the temple of the tent of witness? The seven angels with the seven plagues. They come out of the inner sanctuary. What that tells us is that the judgment they are bringing is coming directly from God. Back in 6:10 we saw that the coming judgment was a divine judgment brought about by the prayers of God’s people. That point is further emphasized here by what the angels are wearing. They are pictured in priestly clothing—bright linen and golden girdles. Such a girdle was worn by a priest only when he was officiating on behalf of the people. These angels dressed as priests come directly from the presence of God to wage a holy war against Rome. We have already discussed the four living creatures in 4:6-8 who protect God’s reputation and demand punishment of the ungodly. It is one of these living creatures who passes out the bowls of wrath to the seven angels. The Greek word used here for “bowl” occurs only in Revelation (where it appears 12 times). It denotes a broad shallow vessel or a deep saucer. It is similar to some of the bowls used in the Old Testament for sacrifices and rituals. What is the purpose of these seven bowls? The purpose of the seven seals was to reveal. The purpose of the seven trumpets was to warn. The purpose of the seven bowls is to execute. Why does verse 8 say that no one could enter the temple until the bowls were completed? Because these events were a manifestation of the glory of God upon which no one could look. The message from the Old Testament was that no one could look upon the glory of God and live. God’s judgment of Rome was likewise a manifestation of his glory. There is another possible reason why we are told that no man could come into the temple until the seven plagues of the seven angels had been completed. That prohibition may be a symbolic statement that no approach of man to God could halt the coming judgment. The time for talk was over. 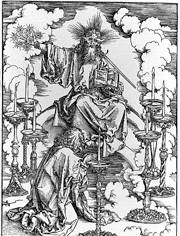 Swete: “The divine judgments are impenetrable until they are past; when the last plague has fulfilled its course, the smoke will vanish, and the vision of God be seen.” Then we will see clearly what is now obscured. What’s next? Chapter 16 describes these seven bowls, which depict a total and complete judgment against Rome. The trumpets were intended to warn. The bowls are intended to recompense. That Christians are not to take vengeance on their persecutors does not mean there will be no vengeance. Vengeance is mine, saith the Lord! 1 Then I heard a loud voice from the temple telling the seven angels, “Go and pour out on the earth the seven bowls of the wrath of God.” 2 So the first angel went and poured his bowl on the earth, and foul and evil sores came upon the men who bore the mark of the beast and worshiped its image. No one to my knowledge has ever successfully assigned definite meanings to each of the symbols in this chapter, and neither will we. Milligan explains the situation well: “No attempt to determine the special meaning of the objects thus visited by the wrath of God — the land, the sea, the rivers, the fountains of the waters, and the sun — has yet been, or is ever likely to be, successful; and the general effect alone appears to be important.” And, as will see, the general effect is staggering. Because 15:8 indicates that no one could enter the temple until the judgment had ended some surmise that the voice in verse 1 is the voice of God commanding the bowls to be poured out. The first bowl contains foul and evil sores that afflict those who worship the image of the beast. This bowl parallels the sixth plague against Egypt in Exodus 9:11. The word used for “sore” in this chapter occurs elsewhere only in Luke 16:21, where it denotes the sores on Lazarus the beggar. These comparisons with Egypt are here for a reason. They remind the readers of how God dealt with past enemies of his people. Everyone knows how the conflict with Egypt ended, and the conflict with Rome will end the same way: A total victory for God’s people. There is a difference, though, right from the start between these bowls and the plagues of Egypt or even the seven trumpets. It was not until the sixth Egyptian plague and the fifth trumpet that men were affected directly, but men are affected directly starting with the very first bowl of wrath. Were the Romans literally afflicted with these sores? No. (I know I keep asking that question and keep giving the same answer, but many misguided commentators try to literalize the symbols in this book, and by doing so they miss the whole point of the book and destroy its beauty in the process.) These bowls and the punishments they bring are symbolic. Yes, the sores in Egypt were literal as was the fire and brimstone in Sodom. But those sores and that fire and brimstone afterward became symbols for those earlier judgments. We have seen the language used that way by the Old Testament prophets, and that is how the language is being used here. If the sores in verse 2 are literal, then what about the beast in verse 2? Is it a literal beast? With the first bowl, God uses a symbol that reminds the reader of an Old Testament judgment against a great enemy of his people. 3 The second angel poured his bowl into the sea, and it became like the blood of a dead man, and every living thing died that was in the sea. We know the plague against Egypt was literal, but is this plague also literal? No. The purpose of this symbol is to remind us of that previous plague. It is intended to remind us of how God dealt with Egypt. And Babylon, the glory of kingdoms, the splendor and pride of the Chaldeans, will be like Sodom and Gomorrah when God overthrew them. It will never be inhabited or dwelt in for all generations; no Arab will pitch his tent there, no shepherds will make their flocks lie down there. But wild beasts will lie down there, and its houses will be full of howling creatures; there ostriches will dwell, and there satyrs will dance. Hyenas will cry in its towers, and jackals in the pleasant palaces; its time is close at hand and its days will not be prolonged. Did that literally occur? No. History tells us that Babylon fell without a shot. The priests opened the gates and let Cyrus in after Belshazzar was assassinated. But note that Isaiah said that Babylon would fall as Sodom fell, that no one would ever live there again, and that no one would ever pass through it again. None of that was literally fulfilled. Alexander the Great headquartered there. People live there today. What then is meant by such language? Babylon, the kingdom, would fall never to rise again. The language was designed to instill terror and describe the wrath and judgment of God against the ungodly. The language paints a picture of God’s wrath against the ungodly. That was how the language was used Zephaniah and Isaiah, and that is how the language is being used here. The second bowl turned the sea into blood. This third bowl turns the fresh water into blood. Again, we are reminded of God’s wrath against Egypt and the first plague, which turned the Nile into blood. Once again, is this literal? No. It is being used for the same purpose as the previous bowl. But why do we have two bowls that turn water into blood? One reason may be to show that this plague is worse than what befell Egypt because Exodus 7:24 tells us that the Egyptians could obtain water by digging, but that does not seem to be the case with this third bowl of wrath. Beyond that all we can say is that the two plagues combine with the other five to create a picture of utter devastation. As if the bloodied sea wasn’t enough, the third angel poured out his bowl of judgment into the rivers and springs of waters, and they became blood also. It gets pretty grim when there is no fresh water to drink anywhere on earth. There’s going to be a big run on Coca-Cola, but even this will give out after a while! How ridiculous! How trivial! It is a crime when such a beautiful book as Revelation is butchered by the likes of Hal Lindsey! And why does he write such sensationalism? Greed! It sells! I am reminded of 2 Corinthians 2:17 — “For we are not, as so many, peddling the word of God.” There were many then, and there are still many today. That cry for justice was what prompted this display of God’s wrath, and that cry came from the martyrs gathered under the altar. Those same martyrs voice their approval in verse 7. Their prayers have been answered. Finally, we should pause to consider the vast difference between what the Romans had to drink and what Christians had to drink. • Isaiah 12:3 Therefore with joy shall ye draw water out of the wells of salvation. • John 4:14 But whosoever drinketh of the water that I shall give him shall never thirst; but the water that I shall give him shall be in him a well of water springing up into everlasting life. The Christians had a life-sustaining drink that was utterly unknown to the pagans that surrounded them and that were drowning in a sea of blood and filth. 8 The fourth angel poured his bowl on the sun, and it was allowed to scorch men with fire; 9 men were scorched by the fierce heat, and they cursed the name of God who had power over these plagues, and they did not repent and give him glory. Thou art wearied in the multitude of thy counsels. Let now the astrologers, the star­gazers, the monthly prognosticators, stand up, and save thee from these things that shall come upon thee. Behold, they shall be as stubble; the fire shall burn them; they shall not deliver themselves from the power of the flame: there shall not be a coal to warm at, nor fire to sit before it. But once again the Romans are getting what they gave. We should recall how Nero had used the burning bodies of Christians. Tacitus wrote that the Christians “were covered with wild beasts’ skins and torn to death by dogs; or they were fastened on crosses, and, when daylight failed were burned to serve as lamps by night.” The Romans wanted blood, and so God gave them a river of it. They wanted light, and so God gives turns up the heat of the sun. They shall hunger no more, neither thirst any more; the sun shall not strike them, nor any scorching heat. For the Lamb in the midst of the throne will be their shepherd, and he will guide them to springs of living water; and God will wipe away every tear from their eyes. As we would expect, the condition of the ungodly is being pictured as opposite that of the godly. And note the response in verse 9 ― “they cursed the name of God who had power over these plagues, and they did not repent and give him glory.” We are reminded of Romans 1:21 ― “Because that, when they knew God, they glorified him not as God, neither were thankful; but became vain in their imaginations, and their foolish heart was darkened.” But notice that the phrase “they did not repent” suggests that even at this last stage, repentance was still an option. The fifth bowl pours darkness on the throne of the beast and its kingdom. The throne of the beast is Rome. This bowl parallels the ninth plague against Egypt in Exodus 10:21 ― “Then the Lord said to Moses, ‘Stretch out your hand toward heaven that there may be darkness over the land of Egypt, a darkness to be felt.’” The darkness here can also be felt. It causes men to gnaw their tongues in anguish. This bowl may depict the moral darkness that we discussed in Chapter 9 where, as you recall, smoke from the bottomless pit darkened the sun and sky. The Bible has much to say about darkness. In fact, the first recorded words from God were “Let there by light!” Spiritual darkness is often described as a judgment from God, and darkness is pictured as the domain of Satan and the opposite of the Christian walk. • Psalm 69:23 Let their eyes be darkened, that they see not. • Isaiah 9:19 Through the wrath of the LORD of hosts is the land darkened, and the people shall be as the fuel of the fire. • John 1:5 And the light shineth in darkness; and the darkness comprehended it not. • John 3:19 And this is the condemnation, that light is come into the world, and men loved darkness rather than light, because their deeds were evil. • John 8:12 Then spake Jesus again unto them, saying, I am the light of the world: he that followeth me shall not walk in darkness, but shall have the light of life. • Romans 1:21 Because that, when they knew God, they glorified him not as God, neither were thankful; but became vain in their imaginations, and their foolish heart was darkened. • 1 John 2:11 But he that hateth his brother is in darkness, and walketh in darkness, and knoweth not whither he goeth, because that darkness hath blinded his eyes. • Ephesians 6:12 For we wrestle not against flesh and blood, but against principalities, against powers, against the rulers of the darkness of this world, against spiritual wickedness in high places. • Colossians 1:13 Who hath delivered us from the power of darkness, and hath translated us into the kingdom of his dear Son. • 2 Corinthians 4:6 For God, who commanded the light to shine out of darkness, hath shined in our hearts, to give the light of the knowledge of the glory of God in the face of Jesus Christ. • Romans 13:12 The night is far spent, the day is at hand: let us therefore cast off the works of darkness, and let us put on the armour of light. 12 The sixth angel poured his bowl on the great river Euphrates, and its water was dried up, to prepare the way for the kings from the east. We should recall that the sixth trumpet also depicted warfare as an instrument of God’s judgment. There in 9:13-19 we saw 200 million troops crossing the Euphrates river to march against Rome. But the war of the sixth trumpet was only a partial judgment — only a third were killed. The war of the sixth trumpet was horrifying, but how much worse must be the war of the sixth bowl! Recall from our discussion in Chapter 9 that “Crossing the Euphrates” was a vivid picture representing the threat of military power. In the Old Testament, the Assyrians and Babylonians crossed the Euphrates river to attack the Jews. Rome feared an invasion from the Parthians across the Euphrates. The Euphrates symbolized a barrier or a deterrent to external invasion, and that barrier has now been removed. The drying up of the waters is a common sign of God’s power. In Exodus 14:21, God showed his power by drying up the Red Sea. In Joshua 3:17, God showed his power by drying up the Jordan river. In Jeremiah 51:36, God threatened to destroy Babylon by drying up her sea. In Zechariah 10:11, God threatened to destroy Egypt by drying up the Nile. Here, in Revelation 16, we see God drying up the Euphrates river to allow his armies to advance upon Rome even more easily than they did in Chapter 9. There will be nothing to stop them or even slow the down.